Estimates of the crowd size that attended President Trump’s El Paso rally range from 30,000 to 35,000. The president tweeted that 75,000 people had signed up. Conversely, the Beto O’Rourke rally was an embarrassing failure, with only a few hundred people showing up. Liberal weenies are claiming the Beto crowd was 7,000. We have the pics, below. You decide. El Paso is my wife’s hometown. Our first child (son) was born there. I am not surprised that there was such a great turnout for President Trump and huge support for the border wall. If anyone knows the true cost of illegal immigration, it is those living on the border who deal with it every day. Are we sure your teeny-tiny "rally" was in America🙄😝or is that "Mexico?" 'Cause we wave the flag🇺🇸of Our Country at each #TrumpRally in #America! I did the math. These patriots are packed fairly tightly, not concert/mosh pit tight (2.5 square feet per person), but the crowd is fairly dense. A loose crowd of people standing an arm’s length apart is calculated at 10 square feet per person. A more tightly packed crowd, like Trump’s El Paso crowd, allows 4.5 square feet per person. Let’s be even more generous and call it 6 square feet per person. The crowd appears to be two football fields wide by a quarter mile deep. That calculates out to 44,000 people. Thus, I believe it is safe to say that there are at least 30,000 red-blooded American patriots in that crowd with another 6,500 inside the coliseum. 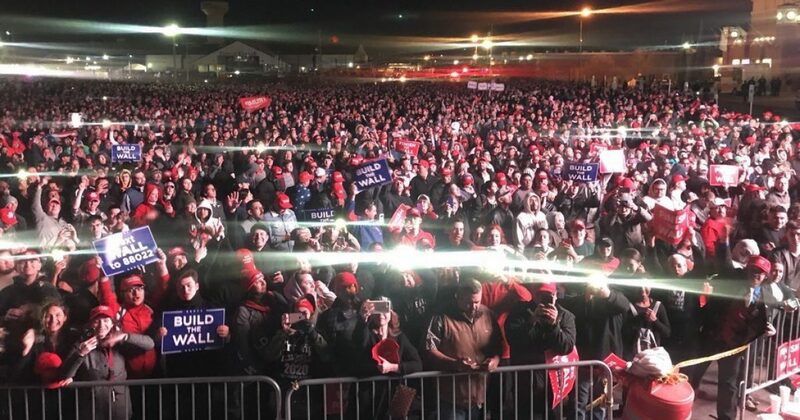 Doing what they do best, liberals were quick to lie and distort the crowd sizes of the O’Rourke vs. Trump rallies. You’ve been lied to Sir. The Beto rally was tiny compared to Trumps. Low IQ individuals are more likely to share propaganda than someone with a higher IQ. You can't possibly think that people made & brought those signs, can you? They were passed out by Trumpers. It's all staged. FFS. At least be smart enough to know that. You expect a rodent to comprehend that? Squirrel is smart enough to run down the tree, get a few nuts in his cheeks, then run back up the tree. Thought requiring higher reasoning is well beyond his ability. He can be trained to press a button to demand more nuts. That's about it.